I woke up this morning with these words, around our desires in life as business owners. 75% of the registered companies on Company House are Sole Traders, a further 20% are Micro Business, employing less that 9 people. So this means of the over 5.5m companies in the UK 95% are choosing to ke ep the employment of staff low, using outsourcing, collaboration, associates and processes to grow their business. This is a significant contribution to the economy, whether employed or self employed the average earnings in the UK are around £23,000. There is a buzz now about ‘scale-up’, The Scale Up Institute and words like ‘UpScale’ used by Tech City. Implying that some people want to scale and they need skills, money, increased resources and capacity to be able to build a business that reaches beyond a few staff and perhaps beyond their local market place. As you know, I love this sector, the creativity, the innovation, the independence, the courage, the highs and the lows, this is a group that are truly living each day to the max. Most have chosen a wave of experiences that are choppy, not calm. Going from feeling amazing, to feeling terrified, all in one day. I know I couldn’t have had a flat life, despite the days that I cannot take my head out of my hands. 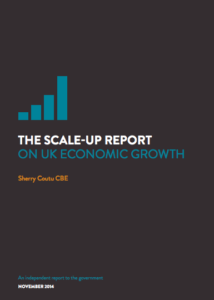 The Scale Up Institute stated in their report three years ago that there are around 8,923 ‘scale-up’ companies that the UK should support http://www.scaleupinstitute.org.uk/scale-up-report/ (definition provided on page 18 of the report). This report struck a chord with Gail and I when we read it in November 2014, the report is compelling and makes suggestions on the support these companies need to reach their potential and the contribution in jobs and revenue (tax) they could make. It also talks about the ‘Scale-Up gap’ that exists in the UK compared to the US. So, this begs the question, are there ambitious scale-ups in here? 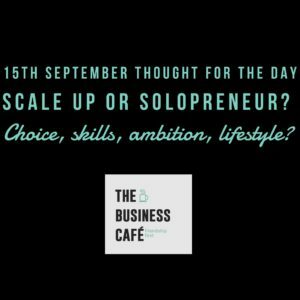 The terms used for sole traders of solopreneur and ‘lifestyle’ businesses, can describe the choices we make, and these are good choices, there is a lot to be said for avoiding the rigors of employment regulations and office costs. I would like to get a grasp on the ambitions of our community, I have many 121s and can tell the skills and work ethics are incredible, but are some of us wanting to scale-up? – This means build capacity in our business to grow fast, wide and employ others? Could you complete this anonymous poll (held within our Closed TBC Group- see below) to help us get a quick grasp? Understanding who we are serving is critical, and no answer is wrong, remember, we believe in the self employed and micro business, but if some want to build bigger, then we should know that too. Your comments would be just as valuable as the statistic, please do share your views on this, the reasons you want to stay small, or the frustrations of getting bigger.